An increasing number of scholars, students and practitioners of psychology are becoming intrigued by the ideas of Gilles Deleuze and of Felix Guattari. This book aims to be a critical introduction to these ideas, which have so much to offer psychology in terms of new directions as well as critique. Deleuze was one of the most prominent philosophers of the 20th century and a figure whose ideas are increasingly influential throughout the humanities and social sciences. His work, particularly his collaborations with psychoanalyst Guattari, focused on the articulation of a philosophy of difference. Rejecting mainstream continental philosophy just as much as the orthodox analytical metaphysics of the English-speaking world, Deleuze proposed a positive and passionate alternative, bursting at the seams with new concepts and new transformations. This book overviews the philosophical contribution of Deleuze including the project he developed with Guattari. It goes on to explore the application of these ideas in three major dimensions of psychology: its unit of analysis, its method and its applications to the clinic. 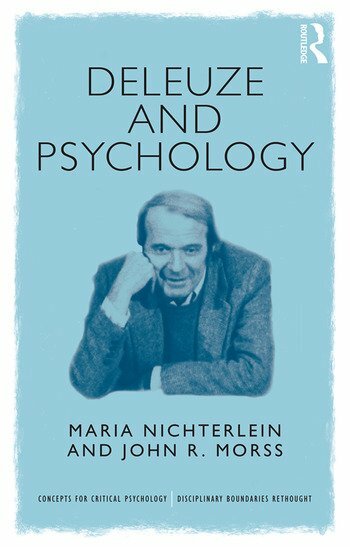 Deleuze and Psychology will be of interest to students and scholars of psychology and those interested in continental philosophy, as well as psychological practitioners and therapists. Maria Nichterlein PhD is a psychologist working both in private practice and as a Senior Clinician at the Youth Brief Intervention Service at Austin CAMHS in Melbourne, Australia. John R Morss PhD is a Senior Lecturer at Deakin University Law School, and a member of the Alfred Deakin Institute for Citizenship and Globalisation, Melbourne, Australia.